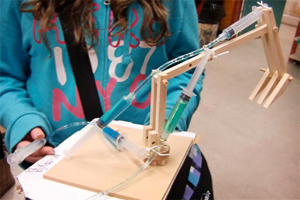 This workshop is perfect for studies around levers and simple machines, engineering design process, fluid studies, and inventions units. Taking cues from the world around us, students in this class will make modern day simple machines that use levers and hydraulics to work. 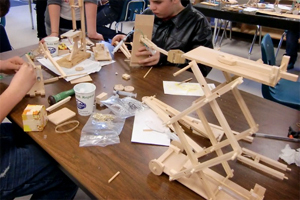 Dump trucks, robotic arms, back hoes, scissor lifts, and cherry pickers are a few of the things that students can make, test drive, and take home. Students will do the design, measuring, cutting, gluing, drilling and testing. Courses come with an outline linking the outcomes of the B.C. 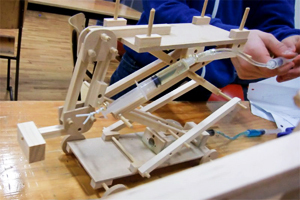 science IRP’s with what the students have done in the class, and are best suited to students in grades 6 to 2nd year University engineering courses. In the workshop, the students act as a team and work cooperatively in small groups, building a structure or mechanism of their own design. Most classes will see between ten and thirteen mechanisms made! All classes are 6 hours (all day usually, but they can be given over two days). All materials needed to make the machines or mechanisms. All tools to cut, glue, drill and make the models. Web activities to follow up the class. Prices start at $250 for each workshop. Call Derek Wulff to discuss scheduling at 250-478-2677, or email here.